Happy Memorial Day and welcome to another My Craft Spot Monday Challenge! 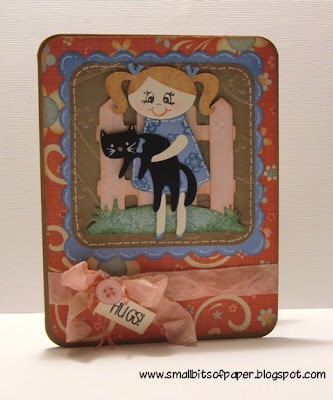 Make a card, scrapbook page or other project that has a cute critter somewhere on it. The birds on Jenny's layout are absolutely adorable!! I love how Kate layered a tag and button with her beautiful bow! I love the fun, happy colors on Joy's card! The layers on Amber's card are great! Click HERE to see all of the fun Bakers Twine at My Craft Spot! 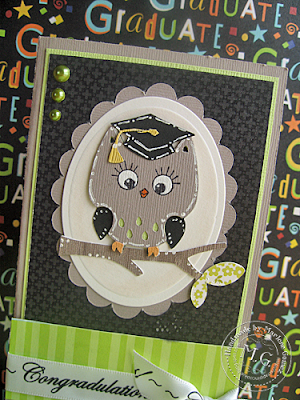 Link up your Cute Critter card here for a chance to win! I had so much fun looking at all of your awesome shape cards! Be sure to grab your challenge winner button and email me with your address so I can mail your prize! Be sure to grab your html code for your Top 3 button on the left side bar! Have a beautiful Sabbath Day! Freshly Picked - Mushrooms card and Twinery Bakers Twine! Hey everyone, Hope you are having a super weekend! 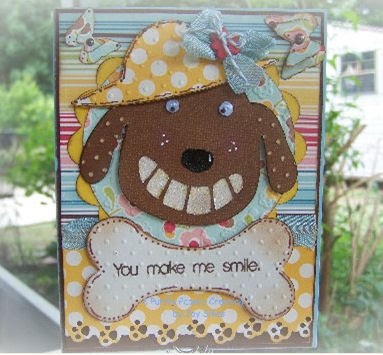 Today I have a fun card and I have also added Bakers Twine from the Twinery to My Craft Spot! New to My Craft Spot! Bright, Summery colors of Bakers Twine from the Twinery! Lilac, Caribbean, Blossom, Honey Dew, Cappuccino, Black, Pink Sorbet, Lemon Drop, Maraschino, Peapod, Mandarin. I just couldn't resist adding the bright colors of Twinery Twine to My Craft Spot! They go super with your brighter colored cards. I used Maraschino and Lemon Drop on this card. The Mushrooms were cut from the Freshly Picked cartridge at 3.53 inches and the little troll was cut at 2.14 inches. I inked all of the pieces and added lots of dots with my white gel pen. The cute face is from Peachy Keen Stamps. The cloud was cut from Create a Critter at 1.35 inches. For the cloud's shadow, I cut a second cloud at 1.66 inches. The Stamped Sentiments are from Sweet Sentiments #1 and Inside and Out #2. The patterned paper is mostly Pebbles. The brown patterned paper is Crate Paper and the greens on the troll are Bazzill. 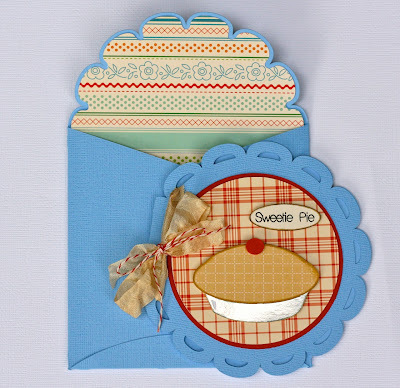 I am entering this card in the Fantabulous Cricut Challenge #61 - Blue skies. This gift bag is about 8 inches tall and 6 inches wide and comes from the Wrap it Up cartridge. I just picked a bag/ box (this was the one with the books in the center) and used the hide contour to hide the center cut. The box is 17.50 w by 14.62 h. I wanted to make it as big as possible so I loaded it onto my 12 x 24 mat and pushed the handles off the top of the screen on my gypsy. There were still little stubs of the handles left after cutting this out, so I trimmed those off with scissors. I think this is the biggest bag you can make with the Cricut! The cupcake is from Create a Critter and was cut at 3.75 inches. The face stamp is from Peachy Keen. I used a little packing tape on the 2 sides at the bottom of the bag to make sure the bottom of the bag wouldn't fall open. I punched holes in the top of the bag and set mini eyelets. Then I threaded Scarlet Red Crinkle Ribbon through the eyelets and tied a knot in the back behind each eyelet. I entered this in this weeks Peachy Keen Face it Friday challenge - which is Designers Choice (whatever you want to make as long as it has a Peachy Keen face stamp)! Good morning my crafty friends! I am having so much fun with shape cards! I scraplifted this idea from Creations with Christina. I love all of her projects, but this was one of my favorites. Click HERE for her original post and awesome video tutorial! The overalls shapes came from the Freshly Picked cartridge, but you could also use your Gypsy to squish (make shorter and wider) the overalls on the Country Life or Every Day Paper Dolls cartridge to get a similar cut. I used my Gypsy to weld two overalls shadows together. Each shadow was 5 inches (height). The video Christina made shows how to do this! Then I cut a pair of overalls (5 inches again) and all of its layers . I used brads for the the overalls 'buttons' at the top on the red and blue overalls and a little lower on the green and orange overalls. Not sure which I like better. The scalloped circle tags come from the Birthday Bash cartridge (cut at 1.46 inches high). I used the hide contour feature to hide the hole in the tag so I could punch a new one where I wanted it to be. The circle was cut at 1.39 inches high. I used white crochet thread to tie the tags onto the brad and then used a small piece of a pop it square to secure the tag to the card. I used decorative edged scissors to cut a small piece of white 'ruffle' to tuck under the bottoms of the overalls. I thought it added a 'girly' touch to this card. All of the stamped sentiments came from Sweet Sentiments Sets #1 and #2. Hope you enjoyed these two cards as much as I enjoyed making them! It's design team day over at Celebrate the Occasion! 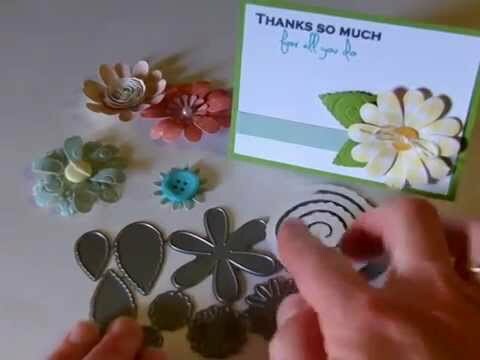 This weeks challenge is to make a card for someone who is retiring. The sentiment comes from Sweet Sentiments #2 and I tied Chocolate bakers twine around the top of the card. All of the paper is from Crate Paper. The grass is from the Paper Doll Dress ups cartridge. I used glossy accents on the golf clubs and darker parts of the golf bag. Be sure to check out all of the other fun cards from the DT and enter the challenge! 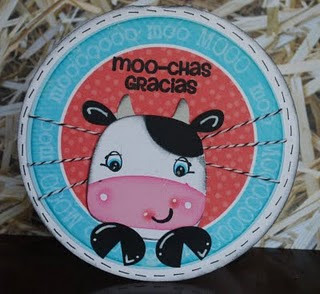 Welcome to another My Craft Spot Monday Challenge! Shape cards are so much fun! I can't wait to see all of the great shape cards you come up with! Be sure to click on each designers name to see instructions and more pictures of their fun shape cards! Don't you just love the matching envelope?!?! I love Ally's choice of patterned paper! 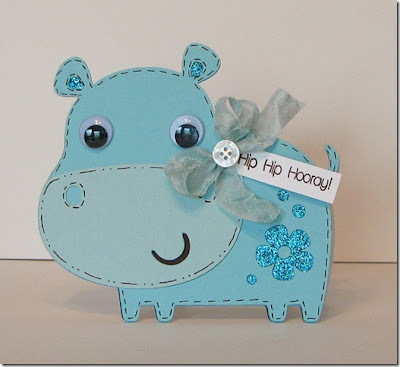 Isn't this hippo just adorable?!?! I love how Amy used the ribbon and button to attach the tag! I thought I would add a few cards to give you some more ideas! The first two should look familiar. :) Click HERE and HERE for instructions and more pictures. These overall shape cards are new (never posted) and I will post instructions for these later this week - stay tuned! This is what you could win this week! Link up your shape card for a chance to win! We have a winner (randomly) picked from last weeks challenge! Be sure to grab your challenge winner button and email me with your address so I can get your stamp set in the mail! Design Team Top 3 picks! Pick up truck full of hearts! Monday Challenge #8 - Congratulations! Happy Birthday Window card - floating candles! Monday Challenge #7 - Bling it up! Thoughts for Sunday #3 - Happy Mother's Day! Country life - congrats on your success! Monday Challenge #6 - We love you, Mom!